Hi everyone, my name is Steve Mac and I’m a professional guitar player and guitar tutor. I live in the London borough of Greenwich where I visit six locals schools to offer guitar lessons. I also offer private guitar lessons from my home teaching/recording studio on a one to one basis. My work as a proffesional guitarist consists mainly of solo acoustic guitar performances. 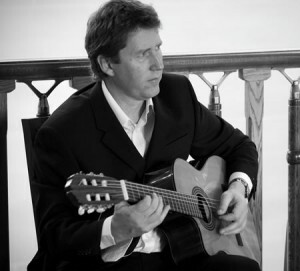 I am the resident guitarist at the All England Club in Wimbledon where I play in the Royal Box Restaurant. I also hold a number of residencies in other restaurants and venues all of which I get to play on a regular basis. For a list of venues and dates, please check my gig guide page. As a young boy growing up in the east end of London I was exposed to music from a young age by my mother. My earliest childhood memories are of my mum hoovering the house with the record player on at full volume to the sounds of Tom Jones and Engerbert Humperdink! I can still remember and sing most of the words to this day! Every so often my mum, dad, brother, and myself “would do the rounds” This would mean that on a Saturday evening we would all go and visit different members of our family. When it was our turn we would repay the compliment by inviting everyone to ours, I think you get the drift! These family gatherings were very happy occasions and I have some great memories of the laughter, singing and good times that we had, but there was one house that I just couldn’t wait to visit! My uncle’s house was in Hackney in London, we would travel there on the bus but for me I couldn’t get there quick enough, the reason, his guitar! The guitar was hanging on the wall so after a few drinks he would get it down and play it. To be fair to my uncle he was no Jimi Hendrix, infact I can only ever remember him playing one songs which was “Silent Night” (He would play this all year round bless him!) But that’s besides the point, the impact of those chords he played had such a powerful effect on me that I can remember it as if it was yesterday. This then started a long period of pleading with my parents to buy me a guitar for Christmas which they did and I have played ever since. I really hope you like my little story, I’m sure there are guitar players out there who have similar stories of “how did it all begin for you” if you have and you want to share it, please send it to me, I would genuinely love to read it.